The attorneys at the law firm of Akin, Webster & Matson, P.C., in Macon, Georgia, have extensive experience helping people obtain debt relief under the Bankruptcy Code. Our lawyers, Danny Akin, Joy Webster and Rob Matson, have 80 years of combined experience handling consumer bankruptcy cases. Rob Matson is board-certified in consumer bankruptcy law by the American Board of Certification. As of mid-2014, he is the only board-certified consumer bankruptcy lawyer in Macon and Warner Robins. When you schedule a free initial consultation with our law firm, you will meet face-to-face with an experienced bankruptcy lawyer who will review your unique circumstances. Our team of lawyers believes that you should have access to a knowledgeable attorney. You will meet with a lawyer, not a paralegal. If you are facing foreclosure, repossession, garnishment or any other problems linked to unmanageable debt, you likely have many questions about your financial future. You can trust that our lawyers will listen to you, advise you and work with you to craft the best legal strategy to assist you with your debt problems. The attorneys at the law firm of Akin, Webster & Matson have helped thousands of individuals, married couples and business owners or corporations seek debt relief through Chapter 7, Chapter 11 or Chapter 13 bankruptcy. We also have extensive experience in bankruptcy litigation and appearing in adversary proceedings. If you are facing overwhelming debt, call our firm for a free consultation. We proudly serve people in Macon, Warner Robins, Perry, Milledgeville, Jackson, Cochran and every city located in the Middle District of Georgia in seeking a fresh start through bankruptcy. With the real impact that financial stress has on every part of your life, you owe it to yourself to learn how filing for bankruptcy can allow you to obtain a fresh start. 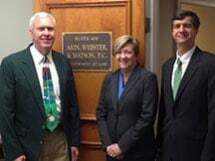 At the law firm of Akin, Webster & Matson in Macon, Georgia, we dedicate our practice to helping individuals, families and business owners obtain relief from unmanageable debt. Chapter 13 bankruptcy is an effective tool for many to reduce debt and protect property. Our experienced attorneys understand how daunting it is to face the threat of losing your home, the car you need to get to work or the money that you need to pay the bills. We have compiled a list of concerns that many people have about the bankruptcy process.